There are so many different ways to talk on the phone today and everyone seems to have a preference. But how can anything beat the wireless headset? 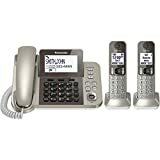 The best cordless phones with headset jacks offer flexibility, letting you use a headset when desired and a more traditional style of phone the rest of the time. Especially when using a headset, call quality should be top of mind when buying a phone system. A lot of phones have terrible call quality! Don’t buy before making sure the model offers crystal-clear audio. After doing a lot of research, we came up with this list of the 10 best options for cordless phones with headset jacks. You also need to look out for cordless phones and headsets that don’t offer a very good range. The convenience and flexibility of cordless are lost if you can’t move around more than 50 feet. What exactly is an expandable phone? This VTech cordless phone is expandable up to five devices. It allows for multi-line operation. In addition, you can conference between an outside line and up to 2 cordless handsets. This is a landline that understands you’re also using mobile and makes it easy to use both. You can easily share and add contacts from your landline system to your mobile and vice versa. It’s even possible to set up mobile notifications for your landline. The Bluetooth Connect to Cell and answering system is revolutionary, allowing you to answer your cell on your landline or your landline on your cell. 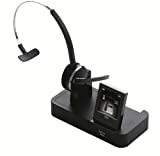 I also included on this list some standalone headset phones, phones with wireless headsets included, and wireless headset solutions that plug into existing phone systems. You can even access Siri or Google Now from the cordless handsets to place a call or text from your cell phone. Whether you use the two included handsets or the headset jack and no matter where you are in your home, the call quality is crisp and clear thanks to DECT 6.0 transmission. You can connect up to two cordless headsets. The answering system allows for up to 22 minutes of recording time. 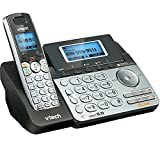 Verdict: The VTech DS6771-3 DECT 6.0 Expandable Cordless Phone offers convenience and flexibility and also stands out for offering cellphone integration. This phone features 2-line operation. It comes with just a handset plus a base that can function with speakerphone. It is fully headset compatible with a 2.5mm jack. This phone offers great range, allowing you to experience good call quality on either the cordless handset or a headset no matter how far away from the base you might be. This unit is expandable to up to 12 handsets when you buy a special accessory. DECT 6.0 gives you great call quality. A multi-line phone system like this is easy to use as it offers dual Caller ID and call waiting. There is also a digital answering system with a mailbox for each line. It is easy to read, thanks to the high-contrast backlit LCD and lighted keypad on both the base and the handset. Overall, it’s very easy to use, probably because it stays pretty simple and straightforward. One frustrating thing about this phone is that to use a headset, you have to connect it to the cordless handset rather than the base. It does come with a belt clip to make it easy enough to carry the handset around with you while talking on the headset but this setup has the potential to be frustrating for some people. 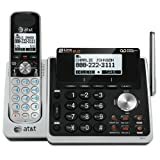 Verdict: The AT&T TL88102 DECT 6.0 2-Line Expandable Cordless Phone offers straightforward setup and easy operation along with crystal clear call quality and fantastic range. This phone is a standout option for anyone who is visually impaired. It uses an enlarged font and has extra-large, backlit keys. These features improve readability for everyone but especially those whose vision is somewhat compromised. Expandable to up to 12 handsets, this phone is also compatible with an AT&T cordless headset and speaker. The DECT 6.0 digital technology provides great audio clarity and excellent range. This phone has an eco mode to reduce power consumption and save battery life. It also lets you save up to 50 numbers in a digital phonebook and has Caller ID. 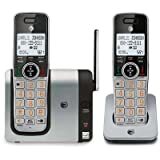 Verdict: The low-cost AT&T CL81214 DECT 6.0 Expandable Cordless Phone offers good sound and good range but really stands out for offering good readability, even for those with visual impairments. This phone comes with three cordless handsets compatible with any standard headset. For the best value, there is a bundle that includes a headset and a range extender as well as the base and three handsets. If you don’t get the bundle, this phone is compatible with any AT&T cordless headset and speaker. The DECT 6.0 signal is quite good and offers a very good range but the extender ensures you get the maximum call quality at the points furthest from the base. This is another phone with the cool feature of being able to link up to two smartphones via Bluetooth. This lets you make and receive mobile calls on your handset or headset from anywhere in your home. With the Link2Cell feature, you don’t even need a landline to make great use of this device. Another nice feature is the Talking Caller ID announcements available in English and Spanish so you don’t have to get up to see who is calling if you don’t happen to be near the base or one of the handsets. You can easily block up to 250 telemarketers, robocalls, and other unwanted numbers using a simple one-touch block button. It’s also easy to save the numbers you want. You can transfer and update up to 3,000 names and numbers from your mobile phone. The noise reduction feature makes it easy to hear, even when the person you’re talking to is in a noisy place. It automatically suppresses background interference while also enhancing voice tones. Other features include rechargeable backup batteries in case the power goes out, a baby monitor function, and even the ability to find your keys with the Key Detector. You have your choice of 25 different ringtones, including some very pleasant options. Verdict: The Panasonic KX-TGE463S offers extendability, easy integration with your mobile, and the option to opt out of landline use altogether without giving up the convenience of a cordless handset with headset. This cordless handset has a port on the side for connecting a headset. To use a headset, you’ll probably want to invest in a belt clip. Neither the belt clip nor the headset is included. For those worried about identity theft, this phone offers good security precautions as all calls are digitized and encrypted. This phone is expandable up to 12 handsets. You can have two lines on one jack and each line has its own answering machine mailbox. The DECT 6.0 call quality is quite good and there are interference-reducing measures in place. It offers Caller ID and Call Waiting and it will store 50 calls. You can also store 50 contacts in the digital phonebook. A blue backlit keypad and display make it easy to see in any light. 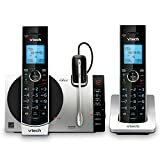 Verdict: The VTech DS6151 2-Line phone with answering machine is a decent mid-range option but you do have to buy a headset separately. Coming in at a low price point, this phone offers good range, surprisingly clear quality, and good security. The DECT 6.0 call quality offers good noise reduction and amplified volume with a dedicated volume key. It includes one cordless handset but it is expandable for up to six handsets. You do have to purchase a headset separately but this budget phone is headset-ready. The Panasonic KX-TCA430 Comfort-Fit, Foldable Headset is a good fit for this model. Additional functions include tone equalizer, intelligent eco mode, and power backup operation. With Link2Cell, you can easily link your mobile phone. When a call comes in on your mobile, the text-to-speech function announces the caller’s name. Another option with this phone is the Key Detector, to help you find your car keys. You can register and name up to four different Key Detectors. 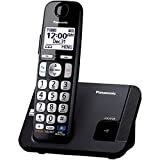 Verdict: It’s hard to find a good cordless phone with headset functionality at this price point but the budget Panasonic KX-TGE210B offers very good quality. Many people like versatility in their phone usage, going back and forth between a handset, a headset, or even speakerphone. This phone is for the crowd that prefers to use the headset all the time. It consists of a small base with a headset rest. The headset itself can be worn over-the-head or over-the-ear. It has a flexible mouthpiece that lets you place it in the optimal position. For hands-free convenience, there is an integrated belt clip. There is also a small dial pad to make calls. This unit holds a charge quite well, offering 10 hours talk time or 8 days standby on a single charge. The DECT 6.0 wireless technology offers interference-free call quality. It also boasts a wireless range of up to 300 feet. The noise-canceling microphone is great if you tend to make calls in a busy or noisy environment. Verdict: For those who like to make all of their calls with a headset, the Plantronics 80057 is a reasonably priced option that offers convenience, flexibility, and very good call quality. This phone offers something for everyone. For those who like to go old-school, there is a corded phone. For everyone else, you have your choice of cordless handsets or an optional cordless headset. This phone comes with two cordless handsets in addition to the corded phone but it is also fully headset-ready with a 2.5mm audio jack. When telemarketers or crazy exes call, you can easily block up to 250 numbers with the one-touch Call Block available on the base unit and handsets. Talking Caller ID makes it easy to know whether it’s worth answering the phone. On the base, there is a high-contrast LCD screen that you can adjust to maximize readability. You can save up to 100 numbers in the phonebook. The range is quite good but this unit is also compatible with range extenders. For the hard of hearing, this phone is compatible with Hearing Aid T-Coil. DECT 6.0 sound quality is excellent and there are noise-reduction features as well. This is also more than a phone as it offers baby monitor and key detector compatibility. Verdict: If you like options in your type of phone, the Panasonic KX-TGF352N cordless phone with headset jack has you covered with the choice between a corded phone, cordless handsets, speakerphone, and headset. Especially since it is headset-only, this phone has a pretty hefty price tag but the quality is worth it. A touchscreen base offers a simplified and straightforward operation. If you don’t want to devote a lot of space to your phone system, this compact unit will make you happy. Jabra’s Noise Blackout noise-reduction feature is better than the majority of phones you’ll see. Even when the background is noisy, your voice will sound crisp and clear without all the background sounds. The call quality is improved on your end as well, with acoustic protection that protects your hearing by filtering out a lot of background noise from your caller as well. Even without the noise-reduction features, the high-definition sound is really next-level. This phone is a good choice for a business with telecommuters, as it offers Remote Asset Management. This allows you to configure and implement all of the company’s audio devices 100% remotely from one central point. This phone allows all calls (for your desk, mobile, and softphone numbers) to come to one place. The range for this phone is quite good, allowing you to answer your headset when you are up to 450 feet away. Verdict: It’s a bit pricey but the Jabra PRO 9470 Mono Wireless Headset offers stellar call quality and convenience. As of this writing, this Leitner headset has an incredible 4.8-star average on Amazon with 91% of reviewers giving it a 5-star rating. Especially because it has a steep price tag, this might seem fishy but this phone really does live up to the hype. Leitner even backs it up with a 5-year warranty, a lot higher than you’ll see from most of the competition. The warranty even covers the battery, something you almost never see. This is another very compact unit, with just a charging base and a headset. It features a very comfortable single-ear style, with a soft leatherette cushion for the ear. Designed for all-day wear, it really is comfortable enough that you almost forget you’re wearing it. If you’re all about privacy, you’ll be happy to know that this phone offers enhanced DECT Level A Security. 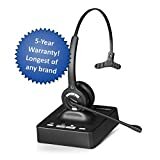 This headset offers dual-connectivity with a lot of flexibility and convenience. You can take calls from your landline or your computer (Skype, etc.) or both. You can even listen to music on your computer with the push of a button. The wireless range is pretty good, working quite well from up to 350 feet away. It’s possible to pair an extra headset, great for conferencing or training purposes in an office setting. It only takes one hour to fully charge this headset and it holds the charge quite well, lasting around 20 hours on average. Verdict: The expensive but very well-reviewed Leitner LH270 Single-Ear Wireless Telephone Headset offers comfort and convenience and is one of the only headset phones that lets you play music in addition to making calls. What kind of socket do they have and do I need an adapter? Most headset jacks are 2.5mm. Generally, most headsets will work perfectly with a 2.5mm jack. Some headphones and headsets are 3.5mm. In these cases, you will need this adapter (2.5mm male to 3.5mm female jack). Can I use 3.5mm headphones if my headset has a 2.5mm jack? You will need to buy an adapter to use 3.5mm headphones with a 2.5mm jack. Luckily, these are quite affordable. The above recommendation is an a good option with a nice low price tag. Is there a way to use my Bluetooth headset with the standard port? Most Bluetooth headsets will work with a 2.5mm jack. In some cases, the Bluetooth receiver will want a 3.5mm port. In this case, you’ll need an adapter. Some of these phones offer Bluetooth integration so you won’t need a port at all. The Panasonic KX-TGE463S is one example. Is there one with a belt clip, or how to add a belt clip? Several of these phones do come with a belt clip. The AT&T TL88102 is one example. With that model, it’s practically a necessity since you need to connect the headset to the cordless handset for it to work. If a belt clip isn’t included, you can buy one separately for a pretty reasonable price. You’ll first want to see if the manufacturer makes one specifically for that model of phone. If they don’t, you will probably be fine with a generic model of belt clip or holster. You could even use a police radio holster. Have you ever used any of these cordless phones or headsets? What did you think? Do you have your eye on any of these models? Let me know in the comments! I’m also happy to answer any questions you might have.